…in a fun and interactive way. 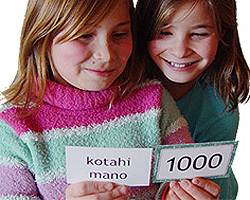 This starter kits contains games and activities to assist you to introduce and reinforce Te Reo Māori basics – designed to engage the whole class or for work in small groups and pairs. 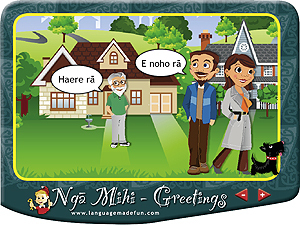 An interactive resource to help students understand what greetings to use in particular situations. Includes sound. 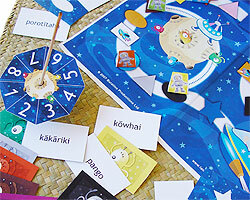 Luna Quest is a selection of language games and activities which you download, print, assemble and play. Luna Quest includes: colour and shape flashcards, playing board, die, spinner and counters, MP3 sound track and language guide, games descriptions and rules, and assembly instructions. Help develop children’s numeracy skills: count and use numbers in everyday situations by playing Buratino Games with number cards and complete activities with numbers. Each set includes: Working with numbers Lesson Plan; four packs of cards in two boxed sets, numbered 0 to 10, plus 100, 1000 and 1,000,000; MP3 sound track; games instructions card; number chart; practice sheets; counting and writing number sheets. The Kit contains download PDFs which are opened with Adobe Reader, and MP3 files as well as a printed product. 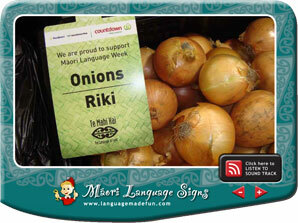 Each kit is licenced for use by one teacher in one classroom, or by one individual or family if bought for personal use. You will receive access for downloading the electronic pdf and mp3 files and the boxed sets of cards will be posted standard mail via NZPost. Please also read our terms & conditions of sale and returns policy.